My little contribution to the world of role playing. Please enjoy. Welcome to all you readers who have bothered to read and better yet click on my little wiki link. As stated previously, this wiki has been built to help both experienced and inexperienced role players. I am not forcing anyone to role play by these rules. The content here is only a guidebook to help those who need it to gain a better understanding of what role playing is. 11/05/2010 - For some strange reason I keep coming back here every two years around the same time going "Hrmmm, I should fix my wiki and update it" and then I never do. It's hard for me to believe this thing is over 7 years old to begin with. I'm very happy that people still use it too. I've spent some amount of time reading over some of the wiki and I've noticed a good part of it is me ranting about my dislikes for some people's role-playing habits. For that I apologize deeply and I've worked on fixing up those sections into more constructive articles on how to tackle and fix the problem rather than just complaining about how you shouldn't do it. My intention with this entire wiki is to help people that want to learn how to role-play. I want to give them guidelines and solutions on how to fix situations they may run into. I am under no circumstance suggesting that should absolutely follow what I am writing in this wiki. Role-playing is like writing a story after all. Aside form the basic guidelines given to construct an outline for what you're trying to accomplish, there are no set limitations. You should not feel forced to write 3 pages for your character sheet or a 1000 words for your posts. What you write is what you write and it will be good as long as you keep in mind the advice given in this wiki tutorial. As of this moment I will be updating the wiki on and off. I don't really know how much time it will take or exactly where I intend on going with it, but I'll do my best to fill it with good information that will be useful. Sections may move around and others may be removed entirely. All will depend on what I am trying to say. I've been doing this role-play business for over a decade and a half now and I'm still learning more and more about it. I don't think this wiki will ever stop growing or changing. As it stands I've made some updates on the first three chapters. Feel free to go through them again if you're interested. For now, this is all I have to say. See you all in another two years. 12/17/2008 – Alright, as I had stated in my previous announcement, I am revealing what it is I am planning for this wiki. I've been gone for about 2 years or so. During those two years I've tried a bunch of role playing games and methods and I have returned with a bagful of knowledge. I intend on re-writing most of the tutorial. I'll also be working on those new sections, possibly be adding more images and working on making the whole thing look nicer. 12/16/08 - I've been gone for a really long time. Hell, a really really long time. I'm actually quite surprised people still read this wiki and comment on it as well. I'm quite happy about that. Now, I'm not sure for how long I'll be back, but I've got me some big stack of knowledge to add to this wiki. I am considering a few projects for it as well. More on this will be coming up shortly and I hope you can all continue to benefit from this tutorial. 01/30/06 - Yay! Role-playing for Dummies is now officially exported. 01/19/06 - The dice chapter has been added and as you can see many other sub-sections that are to be added soon enough. Enjoy. 01/14/06 - It's been a good year and a half since I last updated this place. Currently, I'm just spell checking everything on my tutorial, sorting out links and pages and finding new links. I'm likely to rewrite Kiva's article sometime and will add a new section on dices and such. 06/14/05 - I've added a link to a new example to character sheets as well as links to a good role-play and some more advice on role-playing game creations. 02/10/05 - New likes to some helpful pages added. Enjoy. 07/20/04 - Added a new chapter sub-section. It's more of a rant but I figured it could be of use after what I've seen! Horror! The salt! 06/11/04 - Just wanted to say, there are actually some people who have bother to ask me some fabulously wonderful questions! Yes, it's a miracle!! Even I had not thought of mentioning these things in the tutorial so I've added them to the FAQ. Eventually I'll include them in the tutorial itself but for now make sure that, if you have any questions, to visit the FAQ first before asking away. That's all. Soon I'll be coming up with the actual Elftown RP system they included on the wiki pages and give it a section of its own. Chapter 2. How does free form RP work? - How to play "the right way"
Chapter 3. Building my character. - Rules!! What kind of rules should I make? Do I really need them? Things to consider about weapons - This mainly explains the cause and effects, advantages and disadvantages and things to consider about weapons. It's good help when the times comes of equipping your character with both weaponry and armor. RP: Bad Bios - Mainly some ranting about bad character sheets and some elements GMs see frequently. http://www.springhole.net/quizzes/marysue.htm - A great test that asks you questions you should ask yourself about your character and lets you know if your character is a plain sucky mary-sue or a good ranged character. Elftown Open Marketplace - A wiki sponsored by the WFR for people that are new at role-playing. Here's an amazing RP out there that has been known for supporting my tutorial. It is ran by the amazing [Figgy] and assisted by the wonderful and talented [Duredhel] (I heard a rumor that he's apparently giving free art of your character if you join). Check out X-Men RP. 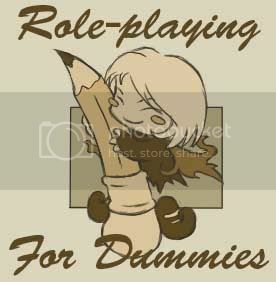 You can link to me using the banner at http://img.photobucket.com/albums/v158/Lunnie/Roleplaying.jpg on your own house. You are free to use any bits and pieces of my tutorial as long as you link back to the tutorial itself. Thanks. This wiki is owned by [Lunnie]. 2008-05-10 [Atropa]: I just want to thank you for making this wiki. I came here a long while back(and haven't been back until now) because I was turned off by some bad role-playing behavior and assumed it was the norm. Not only did you show me that this was not so, but you voiced some of my own opinions about role-playing that had bugged me before. In addition to all that you instructed me in a very clear manner on how to make a second attempt to enter this roleplaying community. Thanks again. 2008-10-25 [Daisy le Fleur]: Thank God for this wiki. 2008-12-16 [Lunnie]: I do indeed, but it's only temporary. 2008-12-17 [Lunnie]: I am an unstable freak? 2008-12-17 [Lunnie]: Mhh... I don't know how long that'll work, but it might be worth a shot. 2010-03-09 [Roma]: Hey, X-Men RP has reopened and we are ALWAYS accepting new players. Join us! 2010-11-05 [Lunnie]: To any of you watching this page, if anything in the "Support and Affiliates" section just happens to be dead please inform me so that I may remove it. 2010-11-06 [SilverFire]: WFR is dead, I think, and AWL is definitely dead. 2010-11-07 [Duredhel]: Lemire and Fantasma are goners too :<. 2014-08-06 [Stephen]: This page is now a Featured Wiki! 2014-08-27 [Sagacious Turkey]: And then the page was revived. 2014-10-23 [Sagacious Turkey]: Bob's Diner is a roleplay chat. You should check it out.